Gilles Muller’s brought a brutally efficient serve to the final of the BB&T Atlanta Open final. But, on a clear, sunny Sunday afternoon, it was nowhere to be found. Despite getting Andy Roddick on the ropes in the first set, Muller lost the match on 10 double faults. 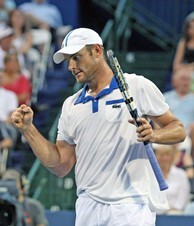 Roddick cruised to his 32nd ATP World Tour title 1-6, 7-6(2), 6-2. It’s been seven years since Muller has been in a final. He was looking for his first title in three finals, having lost in Los Angeles in 2005 and Washington in 2004. Eleven years ago Roddick, a fresh young talent with loads of promise, won his first tournament in Atlanta on clay. He returned this year coming off of a slow start that had many bringing up the question of how long the veteran would play. But, the 29-year-old won in Eastbourne in June and now reasserts himself as an American to be reckoned with going into the London Olympics. Talking about the spring, Roddick said, "It’s been frustrating. I had a tear in my hamstring at the Australian Open. I’m not a very good patient; I was supposed to take six weeks off and I took three." Roddick seemed lost in the first set, not converting easy short balls into winners and getting behind early. His two double faults in his first service game contributed to Muller’s early break. After two deuces, Muller took command in the sixth game and secured a second break. The American took a medical timeout for right shoulder treatment before the start of the second set. "I might have slept on it. Something in there pinched today. I felt like I wasn’t snapping off the ball today. It felt a little dead but with a few days off it will be OK," he added. The second set was built on strong serving but Roddick kept up enough pressure on Muller’s serve to make him save four break points. Roddick’s momentum took control of the match in the third set, as he countered Muller’s failing serve. Muller had been serving extremely well all week; in his semifinal victory over Go Soeda, he compiled a 74 first-serve percentage and won 94 percent of those points. But, in today’s third set, Muller double faulted five times, compared to only five aces. In the first two sets he had 15 aces and only five doubles. Additionally, the Olympian for Luxembourg double faulted twice in each game that Roddick broke. Roddick commented on what a tour title means to him as goes deep in his career. "I’ve always appreciated [the wins]. I never thought it was easy. I’ve won 32 times now and I have never assumed I would win." Muller was asked about his composure in the final set. "The nerves, the nerves. In the third set maybe I lost belief in myself. I got a little more tight and Andy began to play better. I wanted to hit harder. He started stepping in and I went for more. I hit too many double faults, especially in the third set my percentage went too low." Muller talked about his experience at this year’s tournament, the first played in Atlanta at a multi-use facility, Atlantic Station. "Everything is in walking distance," he said. Commenting on the music coming from facility’s hidden speakers, he mentioned. "It’s a lot like Disneyland." But the magic was all for Roddick.